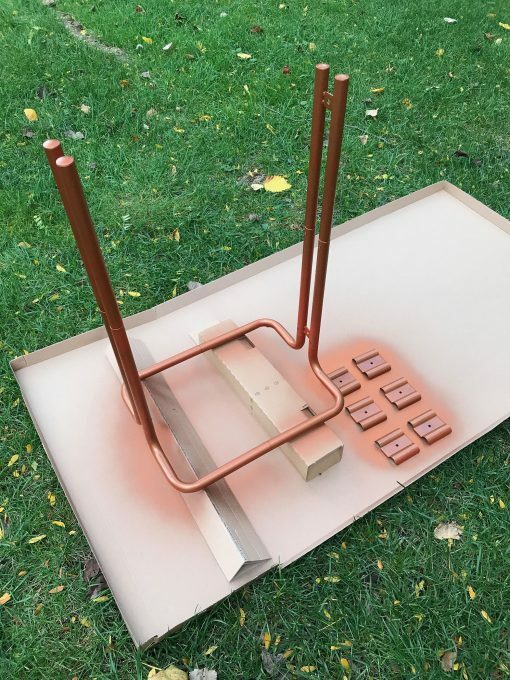 The IKEA Raskog cart makes the best mobile craft supply and tool organizer EVAH! It happened on one of my many visits to IKEA. I was in the warehouse, picking out my gigantic boxes of flat-pack furniture, when I saw it: The Raskog rolling utility cart. I had not planned to get it. I hadn’t even seen it on the display floor. But there it was, looking all cute and so affordable. “I could use that, I’m sure!” I thought. So up onto my teetering tower of boxes that little cart went. When I got home, it sat in its box for MONTHS. Apparently I didn’t have a use for it. Then inspiration struck! 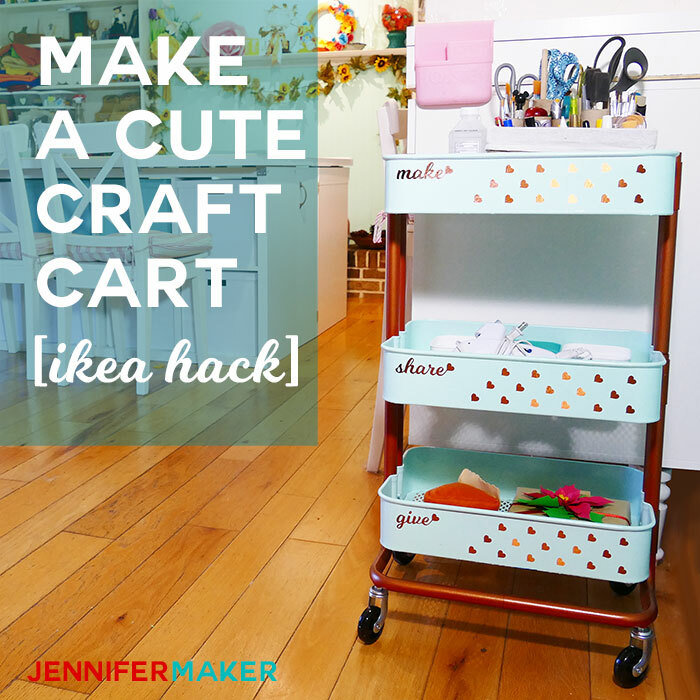 That IKEA Raskog cart became my best craft organizer! There were only two colors available for purchase the day I visited: a rust red and a beige color. I got the red, then later decided it wasn’t right. 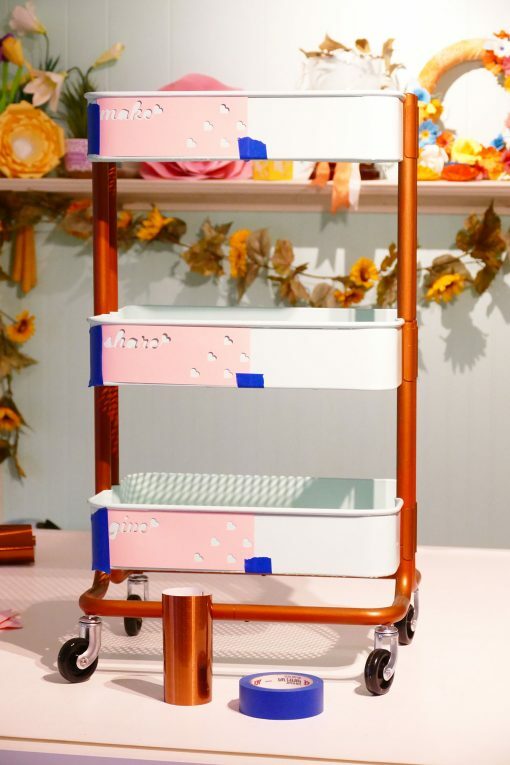 So I painted my cart in two colors — a light turquoise blue and a metallic copper. 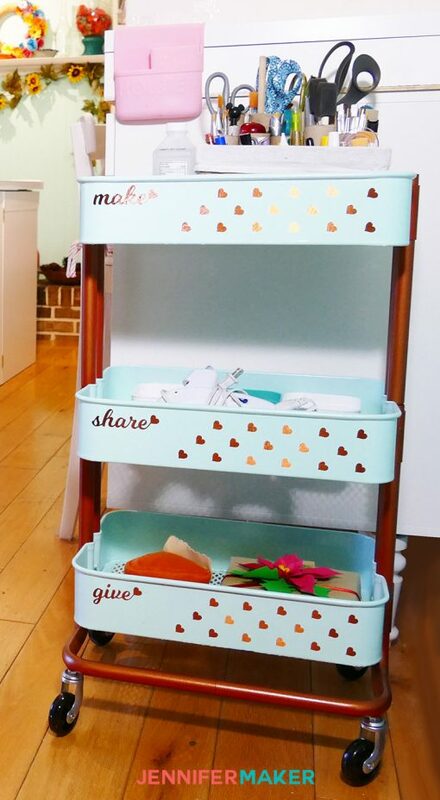 Knowing this would go in my craft room, I decided it needed to look even cuter, so I added some copper foil words and hearts to the sides of the cart. MAKE: The top shelf is where I put keep my craft tool organizer as well as all the little things I’m using to make and craft with and not ready to put away yet. I keep these things on top because I can move it around the room as I work and it keeps them all handy. SHARE: This middle shelf is where things that leave the room are put back. So when my son borrows tape because he lost his (again), he puts it back here. Or when I am tidying up the house but I’m not ready to tidy the craft room yet, things go in here to sort and put away later. 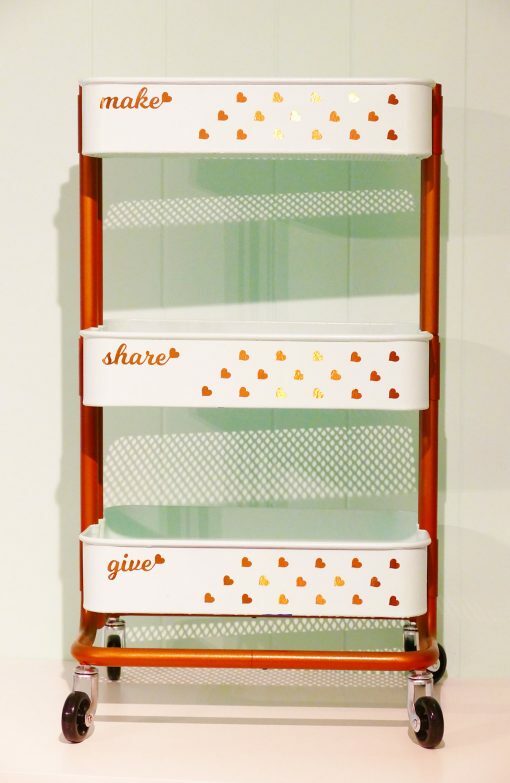 GIVE: The bottom shelf is for things that will leave the room. So that can be the crafts I’ve made for others, gifts I intend to give, or things I want to get out of my craft room and find a new home for. I love it and it’s working beautifully! 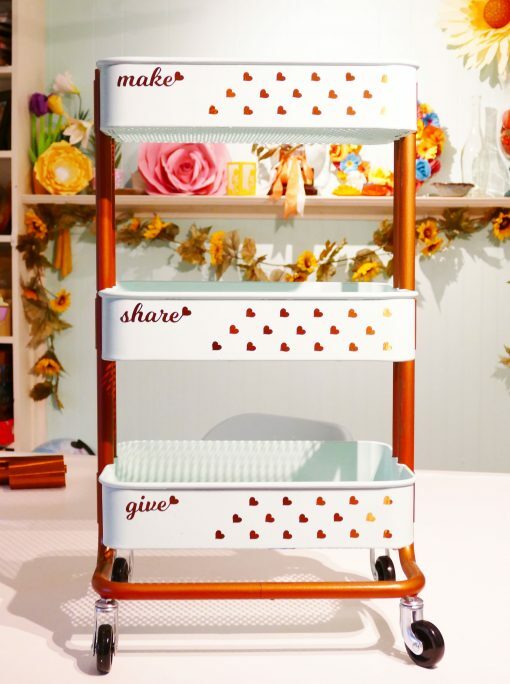 So let me show you how I painted my Raskog utility cart for my craft room. This post contains some affiliate links for your convenience (which means if you make a purchase after clicking a link I will earn a small commission but it won’t cost you a penny more)! Read my full disclosure policy. If you’re doing the two-tone paint job like I am, it’s much easier to paint it before you assemble the cart completely. I put together the frame, but did not attach the shelves. If your cart is already assembled, you may want to remove the shelves before you paint it. Go outside or to another well ventilated spot, place your cart pieces on a drop cloth or cardboard to protect it, and spray paint them. 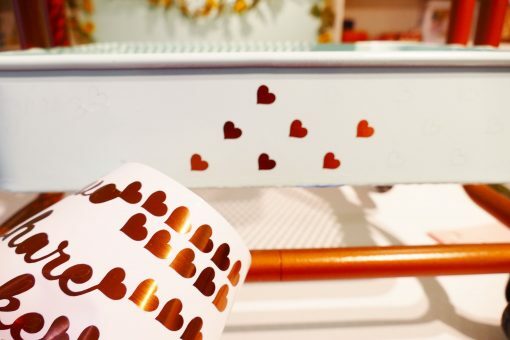 While your paint is drying, cut out your decorations from the adhesive foil. 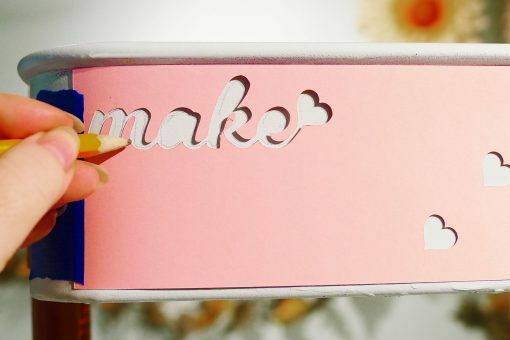 I am all about the love, so I put hearts on mine along with crafty words that remind me what each shelf is for. Note that the adhesive foil is pretty stiff, so I taped mine down flat on the mat with painter’s tape. I cut out a placement template. Both the decorations and template are in my free resource library. Once your paint is dry, spray everything with clear acrylic sealer (to protect it from scratching and flaking) and assemble your cart. Now I taped on my templates to the front of my cart and used a pencil to indicate the position of the letters and hearts. To get the hearts on the other half of each shelf, I just moved the template over and lined them up with the previous ones I’d pencilled in. 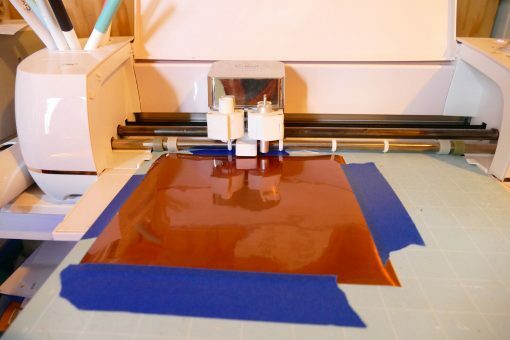 Then I applied my copper adhesive foil to my cart, following the light pencil marks I placed. And that’s it! Super easy and cute. 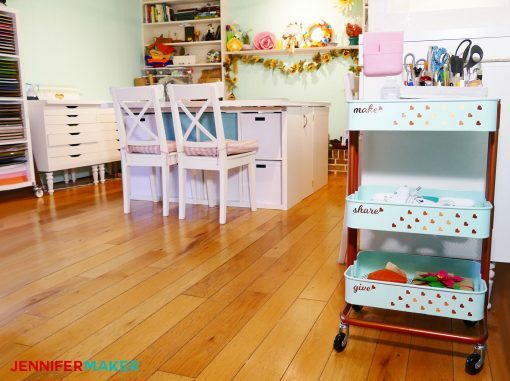 The craft cart matches my craft room perfectly! Here’s where I keep the cart, right at the entrance to my craft room. If you make this, please let me know! Share a photo with me at [email protected] or tag #jennifermaker. Want to remember this? 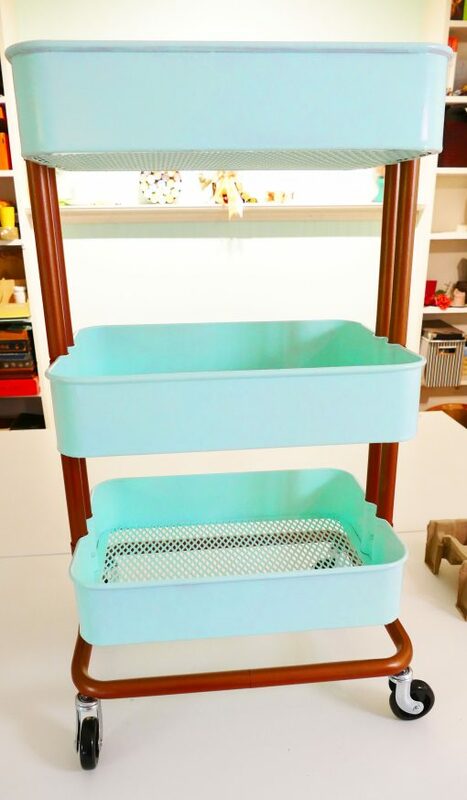 Save the IKEA Raskog Cart Craft Organizer to Your Favorite Pinterest Board! The IKEA Raskog Cart really is the best craft organizer on wheels! 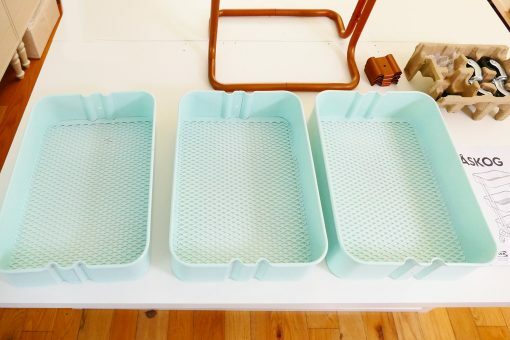 be used for storage.I plan on making your Dust-Cover but with velcro instead of ties. I also want to make the butterfly card. I have one problem, when I watch your videos the volume is so low I can barely hear them. I turned your volume all of the way up and also the volume on my laptop. You are an excellant teacher.. I will soon be a patron. Hi, Sue! Do you have a volume problem with all of my videos, or just some? If so, which ones? I increase the volume on all my videos when I edit them, but I need to know if there is an issue with my more recent videos. Also, do you have issues with any other videos, or just mine?